There are Mondays, and then there are rainy Mondays. Blah! But I have to tell you that when I went out for a stroll around town in my new pink coat, I was feeling anything but blah! 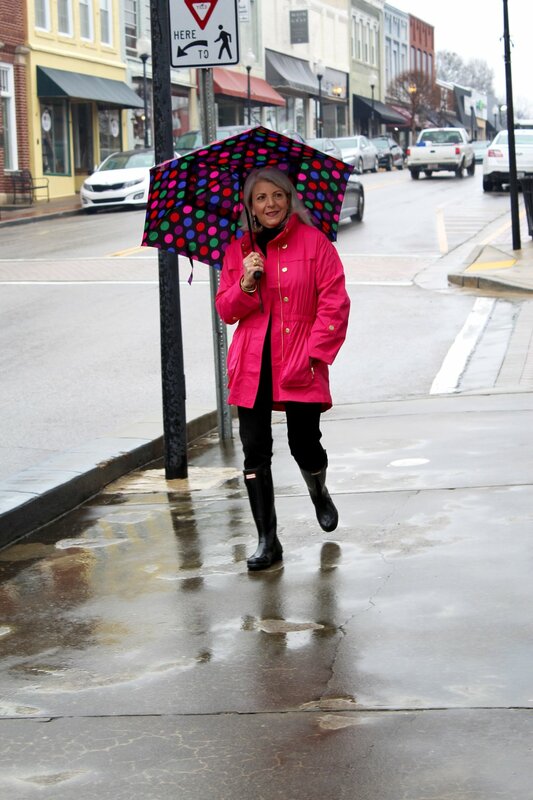 I had pep in my step due to this bright pink rain jacket from Crossings on Main, in Ft. Mill. Located around the corner from where these pics were taken. 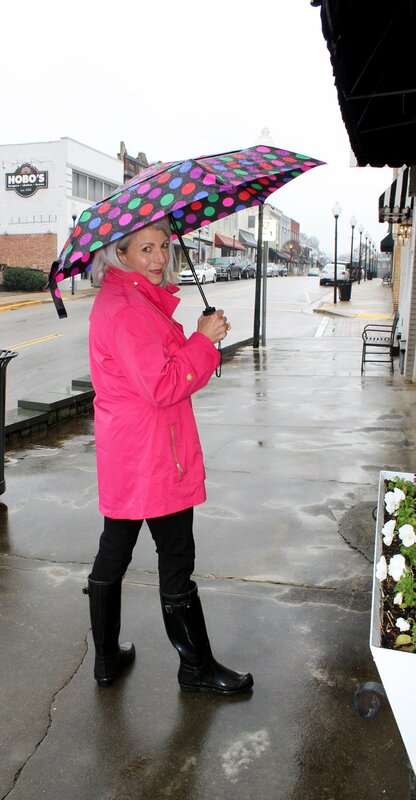 I saw this coat over the winter (which comes in a variety of colors) and told the owner (and my friend) Cathie Smith, I had to have the pink! The jacket is made in Italy and is very high quality and can be worn year round, especially if you live in the south. I will be wearing this throughout the spring and summer rain or shine! I like to shop locally whenever I can and as a frequent Crossing's customer, Cathie has offered to pass along a 15% discount on this coat (mention that Silver sent you or give them the code SILVER.) I promise you will love it. I have included their website and contact here. Call them and they will ship it out to you! Also featured in these pictures are black hunter boots (linked in the gallery below) a polka-dot umbrella from Nordstrom Rack, closet staples; black pants and a black turtleneck and a gold alligator ring found at TJ Maxx.